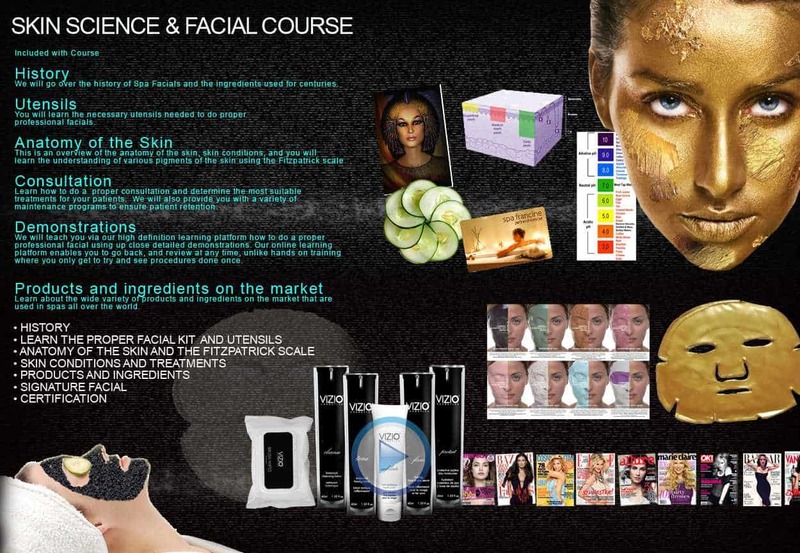 HERE IS WHAT YOU'LL LEARN: The Skin Science & Facial course is the most comprehensive course offered for skin care. In this course, students will learn everything from using the proper kit, utensils and pro-brushes to give a professional facial. Students will learn how to address various skin types and skin conditions using our virtual Fitzpatrick scale and as well as many more invaluable skills. The Skin Science & Facial course is not a DVD directed or membership required tutorial; this is an actual online learning system. Vizio is a highly respected online school offering the most comprehensive training available today. Although many people may post short, independent videos online that offer personal suggestions for facial applications, there is no substitute for professional online training provided by the industry’s leading experts. We offer structured, courses with step-by-step online cloud education, which have been designed to teach you how to give a professional facial, address specific skin types and skin science.